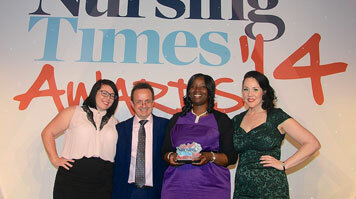 Queen Nyirenda—who is in the final year of the Learning Disability Nursing BSc course at LSBU—attended the glittering 'Student Nursing Times Awards' ceremony held at the Hilton Hotel in London's Park Lane on Thursday 1 May to celebrate the achievements of the student nurses shaping the future of the profession. The competition in the 'Student Nurse of the Year: Learning Disabilities' category was difficult, with judges looking for an exceptional candidate who demonstrated excellence in promoting and enabling social inclusion, interpersonal and communication skills and an ability to act with compassion and empathy, as well as academic achievement. Queen—who came to the UK from Malawi—said: "I had worked as a teaching assistant with children with learning disabilities, and quickly decided that this was an area that I wanted to pursue. I really enjoyed every aspect of the course at LSBU and the placements that I have taken part in, although it has been very challenging. "It came as a complete surprise when I found that my lecturers had nominated me for the award, and even more of a surprise to learn at the ceremony that I had won. I'm delighted to have achieved this at the very beginning of my career." A spokesman for the Student Nursing Times Awards said: "The Student Nurse of the Year: Learning Disabilities award celebrates the unique nature of this sector of the profession, in which the focus is on encouraging this client group to participate in society and to promote and maintain health and wellbeing. "It has been fantastic to see the students continuing to excel in their studies and go the extra mile—and to see the placements and universities providers influencing and inspiring our nurses of the future."